Exhaust fan and ceiling fan installation do-it-yourself projects are becoming more and more popular all around Northern Virginia, but in many cases it is still a wise idea to hire a professional electrician to handle the job. As simple as these two jobs may seem on the surface, the wiring and electrical load within the home can cause problems. In fact, national statistics estimate that nearly 6,000 people die, while 100,000 are injured from electrical accidents and electrical fires in the home, many of which occur when inexperienced homeowners try to install electrical fixtures into their home without proper training. Calling in the experienced electricians at Root Electric to help with an exhaust or ceiling fan installation is always the safe, smart choice. Installing a ceiling fan or two in strategic areas of the home can actually reduce a family’s energy bills in both the summer and the winter. This is why ceiling fan installation is a popular home improvement project for many people here in Northern Virginia, especially with our hot, humid summers. Setting the thermostat a few degrees higher while running a ceiling fan can actually feel just as comfortable as a cooler thermostat setting because it blows the heat away from the body. When people are in the room, using the fan over the thermostat can save a significant amount of money. In the winter, a ceiling fan can push the warm air pooling near the ceiling down to where people can better enjoy it. Then they are not tempted to nudge the thermostat upwards. Bedrooms, family rooms, kitchens and rooms with vaulted ceilings are prime locations for ceiling fan installation. It is important to take several things into account when installing a ceiling fan, and calling our experienced electricians here at Root Electric is a good place to start. 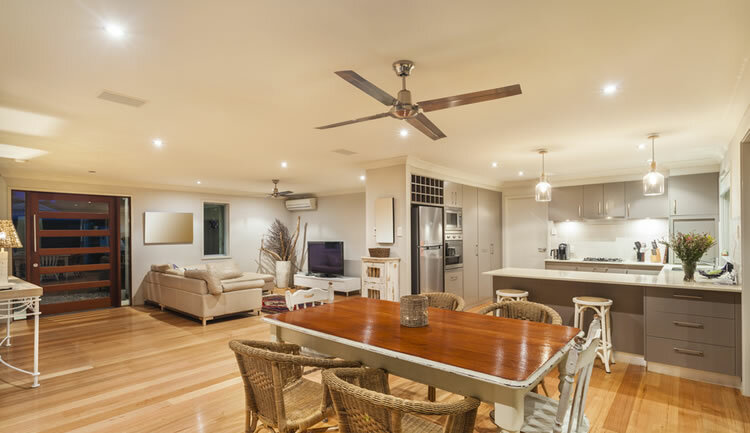 We can help with the ceiling fan installation itself, as well as advise on the best choice for different fans, depending on the ceiling height in the room and whether the fan will be controlled by a wall switch, pull-chains or a remote. Ceiling height is an important factor in choosing the right ceiling fan. Lower ceilings (8 feet and less) usually require flush-mounted fans, whereas ceilings 10 feet high or more would benefit from long-stemmed models. Exhaust fan installation can be even more involved than ceiling fan installation because it involves the duct work going from the inside to the outside, and often involves drywall repair after the replacement or installation. Exhaust fans are an essential part of kitchens and bathrooms as they regulate temperature, moisture and odor levels within enclosed spaces by pulling indoor air to the outside. Until the mid-20th century, bathrooms with windows were not required to have exhaust fans installed, so there are still many homes in the Northern Virginia area where owners must use the window to regulate the moisture level in the bathroom, which may not work very well or comfortably, depending on the weather outside. Our Angie’s List Super Service Award-winning electricians have helped hundreds of Northern Virginia homeowners with safe, high-quality, trouble-free exhaust fan installations and ceiling fan installations. We are happy to make recommendations on which models and styles would work best in your home.